Today the 12th of March sees Card Making Magic celebrating it's 3rd Birthday... and what an exciting three years this has been. The website continues to go from strength to strength as new people join each month. I add new pages on a regular basis and one of the most popular sections is the Video Tutorials. But is is YOU that makes it all worthwhile and I couldn't do it without you. The emails and the comments are what spur me on to do even more, and as long as my efforts continue to get the enthusiastic remarks that they do I will continue to do so. I know the cost of these dies is to be considered ... but when you look at the other tools and equipemnt that you have in your Craft "Stash" then maybe you will see that they aren't so expensive after all. They will help you to create the most wonderful cards and if cared for properly they will last you a lifetime and give you endless pleasure. A few weeks ago I was asked by a company if I would like to try out their product. It would have been rude to refuse and not wishing to appear rude .... I snatched their hand off... politely of course. The company is Want2Scrap and they are the makers of Nestaboard and Nestabling. Nestaboard is a chipboard product that can give you the look of Spellbinders shapes, but they are ready cut out for you to use. You can use all kinds of techniques to the chipboard to create the look you want, so if you don't have the dies or a die cutting machine then these are worth your consideration. This card has had both the Nestaboard and the Nestabling added to it and the Mosaic technique used on the shape. The shape is Labels 20 and is one of my favorite dies. 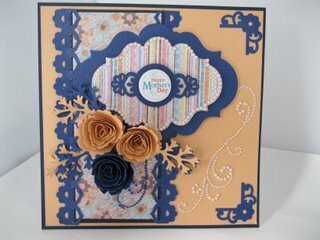 But this card has had a small piece of the Pearly swirl added to the right to finsh the look, and I think it fits in place perfectly. Just iamgine how plain this would have been without that little bit extra on the right hand side. will show you one of the ways to get the most out of this product and it is not expensive. 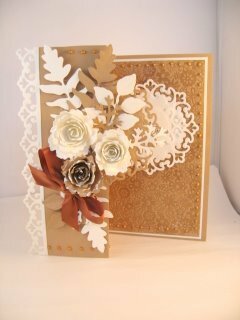 Take a look around the Want2Scrap website for some of their other products, and not just for Spellbinders, and I know you will be tempted. I will certainly be going back for more in the future. Most of the dies will go through any die cutting machine, but you will need the Grand Calibur ...or a die cutter with an A4 platform ... to use the Impressabilities . Another page that has been added is to show you how to get much more from your Nestabilities. In the packs of Labels dies there may be five shapes that will give you the shape to decorate or add you sentiment to. Faux Nesties will show you how to increase that number to fifteen simply by drawing around the shape. There by giving you lots more for your money and a different look to your cards whenever you want. My new adventure into Blogland is going very well and I hope you will come and visit and join the gang of followers. It would be really good to have you on board and leave me your comments whenever you visit. And please also pop over and click the "Like" button to Facebook and help to grow that area too. So all that is left to say is thank you so much for all your support and I hope you will continue to visit the website, Facebook and the Blog in the future. And also for the wonderful submissions that you send to the Gallery and all your lovely emails.